Data are provided in two comma separated (*.csv) files. Figure 1. Photos of recovering burned (left) and unburned (right) sampling sites show vegetation changes due to burning and recovery of aboveground biomass after burning. Photos courtesy of I. Numata. This work was supported by a research grant from the NASA Terrestrial Ecology Program (NNH13ZDA001N-TE). Temporal Coverage: Surveys were conducted in July and August 2014. This dataset is comprised of two comma separated (*.csv) formatted files: forest inventory data and inventory plot locations. 1 Area There are five inventoried areas located in Acre. 2 Transect The transect ID number within an area. 5 Forest_fire Forest classes: Forest burned in “2005”, “2010”, “Burned date unknown”, and “unburned”. In Numata et al. 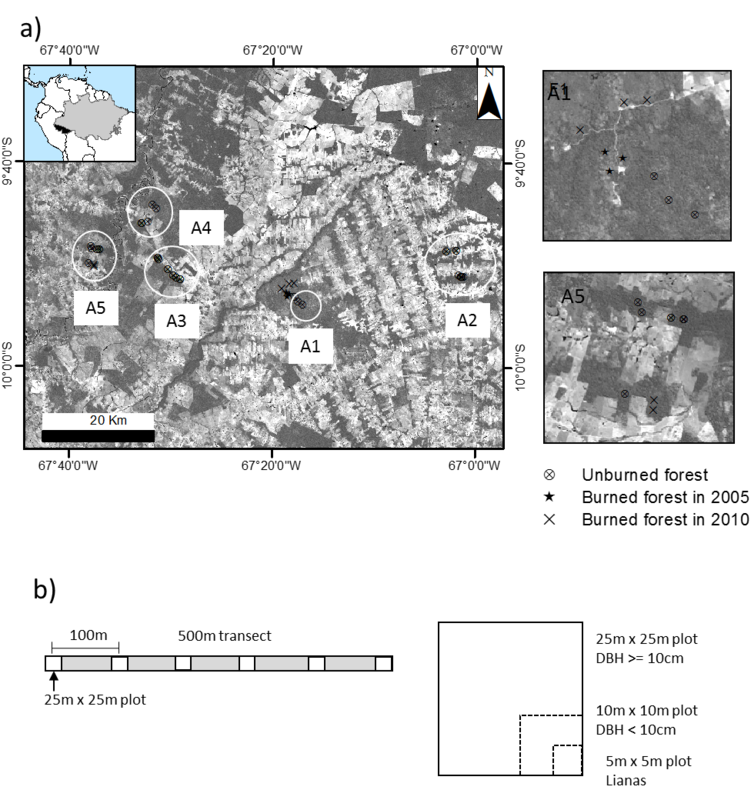 (2017), the data were used to characterize the post-fire forest recovery of sites from wildfires in 2005 and 2010 and determine the edge effects on forest aboveground biomass (AGB) and stem density in different tree size classes in the five fragmented forest areas. Sampled stems were classified as live or dead and botanically identified to species or higher taxon (genus or family) level by two botanists. Forest inventories were conducted from July to August 2014 at five tropical forest sites in the eastern side of Acre state in Brazil. The study sites included one in a forest reserve area (Reserva Bonal, A1) and four within forest fragments situated in private properties (A2 to A5) (Figure 2). The forest reserve has been under a sustainable development project led by the Institute of Agricultural Reform and Colonization (INCRA). All sites were located within a distance of 67 km of each other. Sites included forests burned in 2005 and 2010 and also unburned areas. We established thirty-two 500-m transects across the study region. To establish transects for forest inventories in fragmented forests, we selected areas where forest edges are clearly defined and consist of straight lines and avoided fuzzy edge zone with irregular shapes, while transects were established in forests edges near roads within the reserve. Each transect was designed to contain six 25 m x 25 m plots in every 100 m starting from forest edge up to 500 m into the interior of the forest. However, due to occasional events, such as forest fires undetected by our image inspection, five transects had less than six plots. In total, 127 25 m x 25 m plots (14.25 ha) were sampled over unburned forests and 54 plots were sampled in burned forests. Of these burned plots, 18 were burned in 2005 and 36 burned in 2010. Our study plots of ‘‘unburned” forests were distributed across five forest areas. Figure 2. a) Acre state location in South America (top right map); studied areas distribution (bottom right image) and forest inventories conducted in five forest areas (marked by circles) consisted of four forest fragments (A2 to A5) and one continuous forest area (A1) (zoomed image). Different symbols in the map indicate transect sites in unburned and burned forests. A1 is located in Reserve Bonal and includes forests burned in 2005 and 2010, and unburned areas. There are two more sites burned in 2010 in A5. b) Illustration of a 500 m transect with the six 25 m x 25 m plots and 10 m x 10 m and 5 m x 5 m sub-plots. From Numata et al., 2017. All stems with DBH >10 cm were measured within the 25 x 25 plots. Within each plot, we set subplots of 10 m x 10 m and of 5 m x 5 m to sample stems with DBH < 10 cm and lianas, respectively. Sampled stems were classified as live or dead and botanically identified to species or higher taxon (genus or family) level by two botanists. Species were divided into pioneer and non-pioneer classes. The presence of pioneer species is an indicator of disturbance. Identified pioneer species are listed in Figure 3. Figure 3. 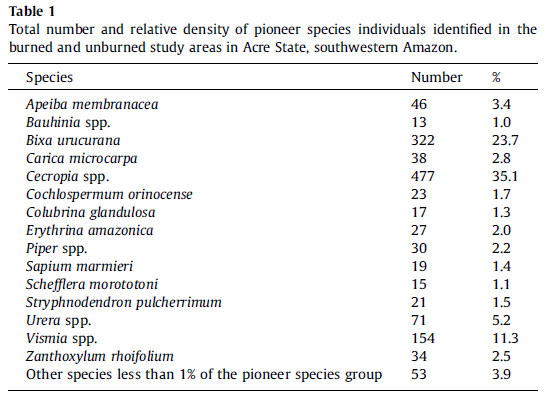 Pioneer species identified in both burned and unburned study areas. From Numata et al., 2017.